n Spanish, the word caballero refers to a knight or a gentleman. Perhaps the most common place to see the word used is on a bathroom door, but more often it will read senor to indicate the mens room. I just visited the Land of Caballeros. No. Not the mens room  the Land of Knights. The La Mancha region of Spain is also known as the Land of Caballeros. It was a visit to Cervantes literary home of Don Quixote, filled with scenes and locations from his famous book, Don Quixote de la Mancha. It is the book behind the many musicals and movies the English speaking world recognizes as Man of La Mancha." I dont know of any other work of literature that has so defined a region, or that is so much a part of a nations identity as Don Quixote de la Mancha is to Spain. 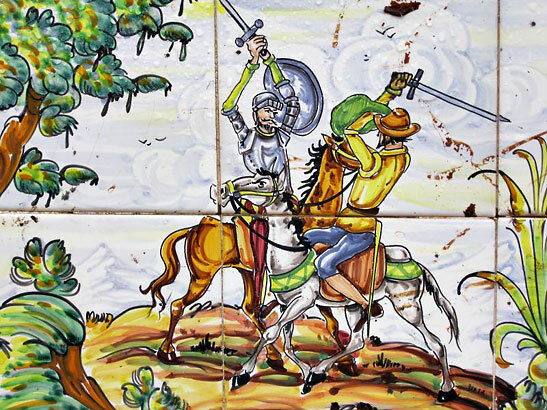 You, too, can explore this national identity by following the Ruta de Quixote. It is a carefully defined self-guided tour of the locations made famous in Cervantes historical novel. The locations are both significant to Cervantes and to his characters in the book, who are at times interchangeable. They illustrate how autobiographical, and how steeped in the people and history of a region the book is. A tour guide along the route remarked that it was required reading when she attended Spanish high school. Since it was written 400 years ago, she said students struggle with the archaic language, much as American high school students do reading Coopers nearly 200 year old Leatherstocking Tales. Yet both define a period and a culture in a nations history. Struggle or not, the themes in Don Quixote of chivalry, the historic conflict between good and evil, and the madness of life and love, are universal. These are themes everyone learns, often by first being exposed to them in literature. 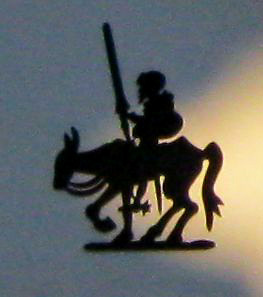 Don Quixote de la Mancha is significant because it also defines a culture, a culture, as every Spaniard knows, that identifies itself with the image of a knight on horseback, holding a lance. Statue of Don Quixote ready to joust with the windmills. To commemorate this iconic symbol of Spanish culture, the routes following the events in the book are laidout for hiking, bicycling and driving. The way is dotted with 12th century castles, windmills, inns, and, in at least one instance, a prison cell where the real and fictional characters met to play out the charade of Quixote. It was there Cervantes began his epic novel. The Ruta de Quixote is a charming tour through the beautiful rolling countryside around Spains capital of Madrid, one I can recommend to everyone. To ease the way, the Spanish Government established a chain of hotels, called Paradores, at convenient intervals. Some are modern, some more like motels than hotels, and some are in creatively renovated historic properties, such as monasteries and castles. The accommodations are rated from 3 to 5 stars, and range in price from 100 to 200 Euros a night for 2 people, usually including tax and a sumptuous buffet breakfast. 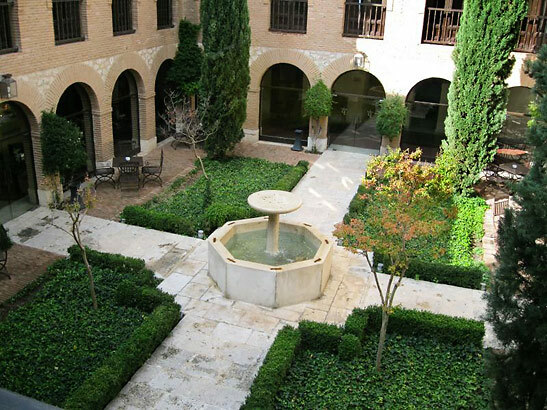 A typical courtyard in one of the historic Paradores. Paradores are a reasonably priced and reliable place to relax and read yourself to sleep with a chapter or two of the ironically witty Don Quixote de la Mancha. Then, youll awaken to fill another day following his adventurous route. There youll find details of a specially designed and economically priced trip along the route visiting six different Paradores for a total of seven nights in a standard double room, including bed and breakfast for about 800 Euros per couple. Your destiny calls. Go! 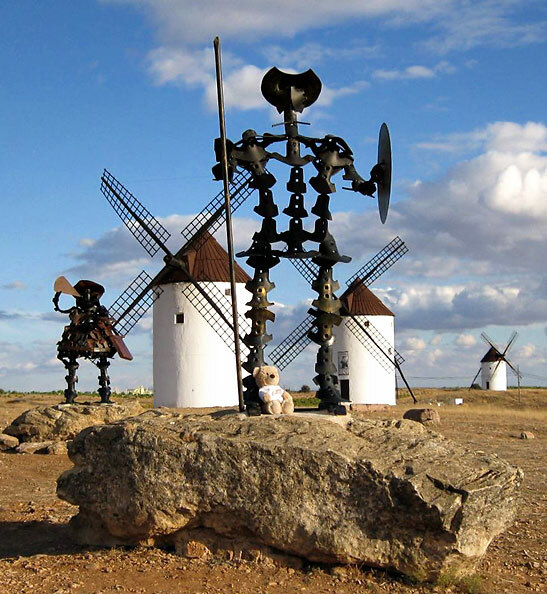 Youll see centuries of history, culture and adventure open up before you like a book - Don Quixote de la Mancha. A note about car rentals: when booked through a third party, such as a travel agent or the airline, you have an ally to go to bat for you if something goes awry. Applying for an inexpensive international license might be a good idea, too.